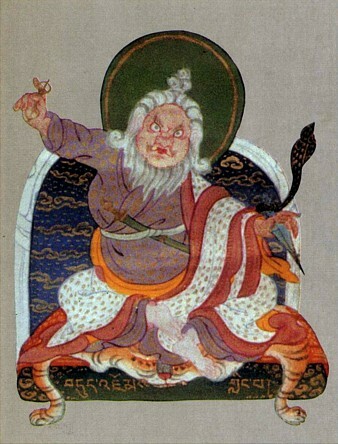 Neluk Rangjung, 'The Vajra Essence’ (Tib. དག་སྣང་ཡེ་ཤེས་དརབ༹་པ་ལས་གནས་ལུགས་རང་བྱུང་གི་རྒྱུད་རྡོ་རྗེའི་སྙིང་པོ་, daknang yeshe darva pa lé neluk rangjung gi gyü dorjé nyingpo, Wyl. dag snang ye shes drva pa las gnas lugs rang byung gi rgyud rdo rje'i snying po) is one of the five Dzogchen tantra termas revealed by Dudjom Lingpa through a Pure vision. Being part of the Daknang Yeshe Drawa cycle, it offers a systematic presentation of the whole path of Dzogchen. Within the Dudjom Tersar lineage, the Neluk Rangjung is an essential instruction manual on Tögal. While editing the text, Dudjom Rinpoche added in his colophon that the Neluk Rangjung 'is the ambrosial essence of speech of the pervasive expanse, uncluttered by scriptural citations, syllogisms, or errors; when well taught, these practical instructions bring enlightenment within a hand’s reach in a single lifetime, ripening as the heart’s power of those of good fortune'. In earlier times, the teachings of the Great Perfection shone like the sun. When sublime, supreme teachers explained them to people with good karma and fortune, first they would gain certainty by way of the view. Then they would identify pristine awareness and dispel their flaws by means of meditation. And finally, by practicing, remaining inactive, they became siddhas and experienced the state of omniscient enlightenment. This is the unsurpassed quality of the Neluk Rangjung, 'The Vajra Essence’. The Neluk Rangjung was revealed by Dudjom Lingpa in 1862, when he was twenty-seventh, through a vision he had of Samatabhadra, manifesting as the Lake-Born Vajra surrounded by an illusory display of bodhisattvas—appearing clearly, yet non-existent. .
Alan Wallace explains that 'The Teacher, Samatabhadra, explains that this gathering will reveal an entrance to itself in these illusory forms. The disciples, who are his own emanations, address a series of questions to the Teacher, who responds generously with detailed teachings concerning each stage of the path of Dzogchen'. And also that 'If the root of these visionary teachings on the unsurpassed path is the Sherik Dorje Nӧnpo Gyü, and the Kunzang Gonpa may be regarded as an elaboration on that text, then the Neluk Rangjung constitutes an extensive commentary on both of them. The above [the Neluk Rangjung] remained as a command for eighteen human years. At the end of that time, when the appropriate circumstances came to pass, at the meaningful request of the disciple Tsechu, the Mongolian Lama Phuntsok Tashi, and Lhajé Rikdzin Zangpo, the syllables brought forth from the absolute space of the illusory matrix of the clear light by Traktung Dudjom Lingpa were written down by the Mongolian Lama Phuntsok Tashi and Lhajé Rikdzin Zangpo from the region of Golok. Düdjom Lingpa, The Vajra Essence: From the Matrix of Primordial Consciousness and Pure Appearances, a Tantra on the Self-arisen Nature of Existence, translated by Alan Wallace, Ashland, OR: Mirror of Wisdom Publications, 2004. Alan Wallace, Dudjom Lingpa’s Visions of the Great Perfection, Wisdom Publications, 2015, volume 3. ↑ Alan Wallace, Dudjom Lingpa’s Visions of the Great Perfection, Wisdom Publications, 2015, volume 3, page 277. ↑ Alan Wallace, Dudjom Lingpa’s Visions of the Great Perfection, Wisdom Publications, 2015, volume 3, page xxxi. ↑ Alan Wallace, Dudjom Lingpa’s Visions of the Great Perfection, Wisdom Publications, 2015, volume 3, page 2. ↑ Alan Wallace, Dudjom Lingpa’s Visions of the Great Perfection, Wisdom Publications, 2015, volume 3, page 1. ↑ Alan Wallace, Dudjom Lingpa’s Visions of the Great Perfection, Wisdom Publications, 2015, volume 3, page 276. This page was last edited on 23 February 2018, at 07:52.